Lester Ouchida and Reiko Nagumo were young children when they and their families were forced from their homes and relocated to remote locations of Arizona and Wyoming because America was at war with Japan. 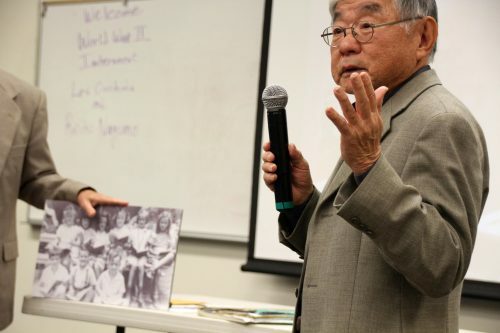 These two Japanese Americans told their stories of the relocation into “desolate” internment camps during WWII to ARC students during a college hour in Raef Hall on Tuesday. The camps were in remote areas constructed with sentry towers and barbed wire around the perimeter of the camp. It was communal living, set up in military style, bunkers to sleep in and the bathroom and chow hall had its own separate buildings. “My dad had a pretty good business and we had a fairly nice home in Florin and all of a sudden we were placed, mom, dad, and five kids in one room,” Ouchida said. President Roosevelt, influenced by the military, signed executive order 9066 in 1942 which imprisoned over 120,000 people of Japanese ancestry and at least 60 percent of them were American citizens. Over half of them were children. Ouchida said that they lost their freedom, financially lost a lot, and it had a deep psychological impact being locked up by their own country. Japanese Americans had a loss of self esteem and self worth. “There was nothing like this for German or Italian Americans,” Nagumo said. 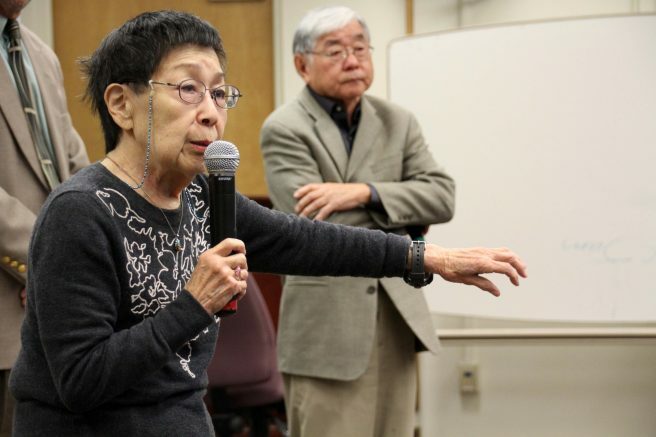 Nagumo said she hopes that what Japanese Americans experienced will not happen to any other ethnic or racial group coming from abroad and that people need to speak up for others. Ouchida feels that the xenophobia and racism toward the latino community that have spread across the country are eerily similar to the times of relocation. Led by President Carter in 1980, a federal commission on the wartime relocation of Japanese Americans ruled that evacuation occurred because of racism, war hysteria, and poor political leadership and had nothing to do with military necessity. She said her parents weren’t able to become citizens until the 1950’s. Nagumo was mortified at being told she couldn’t play with her friend because she was a different color, a different race. ARC student Destiny Dixon said she was shaking after what she heard from Nagumo and Ouchida. 5 Comments on "The internment of Japanese Americans retold by survivors"
As usual the story is incomplete and includes falsehoods, this statement “There was nothing like this for German or Italian Americans,” is just one of them. You see German Americans and Italian Americans were also interned! I was devastated when I read Reiko Nagumo statement: “There was nothing like this for German or Italian Americans.” I was born September 1941 in New York Hospital, New York, NY. Before I was potty trained, I found myself interned in an enemy alien internment camp, Crystal City, Texas. My parents and I were part of an FBI roundup of Germans in NYC to be used for exchanges of American families and diplomats incarcerated in Germany. While my parents were labeled “enemy aliens,” I, along with all other interned American children, was classified “Enemy of the State.” My sister was born in the camp as an “Enemy of the State.” The aftermaths of internment was devastating. My workings in reference to WWII internment of German, Italian, Japanese, including German and Japanese of South Americans, can be found at Facebook’s “U.S. Family Internment Camp, Crystal City, Texas” and http://www.foitimes.com/CampHousing.pdf. As always the interment issue solely focuses on the Japanese. Are you aware that it sure wasn’t easy being German or Italian living in the US at that time because via executive order approximately 300,000 were declared Illegal Aliens though they had done nothing wrong. Many of them were interned, even in same camps as Japanese for example Crystal City, TX. They were then traded with our enemy into a war zone. Many of them were American, born here. None of this was about race, it was about our being at war with rhose three countries. Big quest remains, why do we refuse to recognize what was done to the Germans and Italians. Yes, many innocent people were sent to camps in WWII. Approximately 11,000 Germans, 3,000 Italians, and 120,000 Japanese. In 1940 the U.S. population was 132,164,569, and more than 1.2 million were born in Germany, 5 million had two native-German parents, and 6 million had one native-German parent. So, more than 12 million German-Americans and German immigrants were not in camps, including general Dwight D. Eisenhower. I almost forgot; more than half a million Mexicans-Americans were deported in the 1930’s because this country needed to find a scapegoat during the depression. Between December 7, 1941 and V-J Day, September 2, 1945, only one exchange took place between United States and Japan. This exchange was not between POWs nor civilian prisoners but the recall of all diplomats with the use of the Swedish ship M.S. Gripsholm and the Japanese ship, Asamu Maru. The Gripsholm was chartered by the U.S. government as an International Red Cross exchange ship. Japan assigned the Asamu Maru as its exchange ship. The Gripsholm set sail from New York on June 18, 1942 with 908 adult Japanese and Thailanders, including 180 American born children. The ship docked in Rio de Janeiro to pickup over 400 Japanese adults of Peru and Japanese-Peruvian children. On June 25, 1942, the Asamu Maru set sail from the Port of Yokohama with 2,768 American diplomats and civilians on board. Both ships docked in Port Marques, Portuguese East Africa, and on July 23, 1942, a successful exchange took place. This was the only exchange ever made between Japan and the Allied Powers. However, one may pose the questions: Why only a single exchange of Japanese diplomats for American diplomats? Why not exchange Japanese/Japanese-American internees for American citizens and POWs in Japan as so done with German and Italian families with Europe? After all, many interned Japanese men (patriarchy) signed “Repatriation to Japan” agreements with federal authorities. The answer is that the United States Government knew of the Japanese code of “No Surrender” and perceived, if turned over to Japan, life-threatening dangers towards interned Japanese immigrants and their American born children. The government knew of the Bataan Death March which began April 9, 1942.